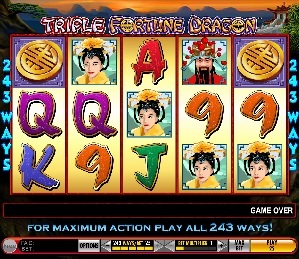 Triple Fortune Dragon is an oriental online video slot machine game launched in September 2008 and is offered exclusively at online casinos powered by IGT. This online video slot game has 5 reels and it offers you 243 bet ways to win per spin, thanks to its MultiWay Feature! The theme of Triple Fortune Dragon is inspired by the Chinese emperors and empresses who ruled China during the historical periods of Dynasties. May the God of Wealth and Prosperity shower you with the Golden Fortune Dragon’s luck and riches in this incredible MultiWay® online slot game that offers you 243 ways to win big! Instead of just betting on individual pay lines, the MultiWay Feature offers you 243 ways to win for just 25 credits only! This goes to show that winning has never been so easier, as you can win on every possible pay line! This slot game features characters and paraphernalia from ancient China. This online slot game can reward you with up to 360 Free Spins when you hit 3 or more Scatter symbols. What also attracts online slots players to this game is because it has an awesome Wild Symbol that not only substitutes for ALL the other symbols (even the Scatter symbol), it also acts as a multiplier that multiplies your winnings, which means more chances of “going home” with your pockets filled to the brim! The Triple Fortune Dragon online video slot game can be played instantly, and you do not need to initially download it. With festive Chinese music and firecrackers lighting up your game screen, Free Spins, wild substitutes + multipliers, scatter pays, the chance to grab a maximum win of 250,000 currency units, and 243 bet ways to win, Triple Fortune Dragon is one video slot machine game that you definitely must try out! Considered to be one of the best-performing slot games in the world of land-based slots games, IGT is proud to bring to you Triple Fortune Dragon online! The setting of this online video slots game is on a kingdom surrounded by mountains during the time of ancient China. The symbols are drawn in a colorful yet simple manner, so your eyes will surely not get tired from playing this particular slot game. When you form winning combinations, the symbols become animated, making your game play more interesting and entertaining. The overall graphic design of Triple Fortune Dragon displays different colors of red, purple, black, green, blue, yellow, and of course, gold. In Triple Fortune Dragon, when you spin the reels, background music similar to the ones you hear in other IGT slot games is played. When you are able to form winning combinations, festive Chinese music with gongs, drums and even fireworks accompany your wins! Experience ancient China and enjoy hours of nonstop slot action with the MultiWay Feature, scatter wins, wild multipliers, and up to 360 Free Spins waiting for you only at the Triple Fortune Dragon online slots game! The regular symbols are the card deck symbols which are 9, 10, J, Q, K and Ace. The other symbols include Chinese royalties such as the Emperor and the Empress, as well as Chinese items such as the Chinese Fan and the China Vase. The Wild Symbol is the Gold Fortune Dragon symbol. It can act as a substitute for other symbols in order to help you complete winning combinations, and it can even substitute for the Scatter symbols as well! This attribute of the wild symbol is not common with most slot games, which is why players really love this Gold Fortune Dragon wild symbol appearing in their winning combinations! The Gold Fortune Dragon wild symbol only appears on the 2nd and 4th reels. Not only can it substitute for other symbols, but it is also a wild multiplier as well! Please take note that a Golden Coin or Gold Fortune Dragon wild symbol that appears on a grayed out (deactivated) reel position can still be able to trigger the Triple Fortune Dragon Free Spin Bonus Feature game. In the Triple Dragon Free Spin Bonus Feature game, the reels are richer, as each Gold Fortune Dragon wild symbol in a winning combination can triple your prize! One Gold Fortune Dragon wild symbol that is part of a winning combination will give you a 3x multiplier on your standard award, while two Gold Fortune Dragon wild symbols that are part of a winning combination will give you a 9x multiplier on your standard award! Keep in mind that a Gold Fortune Dragon wild symbol can also substitute for the Golden Coin scatter symbol; therefore, if a winning combination of 3 or more Golden Coin scatter symbols is composed of a Gold Fortune Dragon wild symbol, then your scatter award is 3x even bigger! Also, if a winning combination of 3 or more Golden Coin scatter symbols is composed of 2 Gold Fortune Dragon wild symbols, then your scatter award is 9x even bigger! The Gold Fortune Dragon wild symbols do not affect the amount of extra Free Spins awarded. Also, please keep in mind that only the highest Gold Fortune Dragon wild multiplier is paid out for a given winning combination. The Scatter Symbol is the Golden Coin. The Golden Coin scatter symbol is not required to come out in a line on an active pay line for you to win. All of the symbols pay from left to right (reel 1 to 5) in consecutive order, except for the Gold Coin scatter symbol which pays in any position on consecutive reels. The Gold Fortune Dragon wild symbol can substitute for the Golden Coin scatter symbol. Your total scatter pay award is equal to the scatter pay multiplier (listed in the paytable) x (times) your total bet. If you manage to hit 3 or more Golden Coin scatter symbols (found anywhere on the reels), you will activate the Triple Fortune Free Spin Bonus Feature game. The amount of Free Spins given and the scatter pay multiplier is dependent upon the amount of Golden Coin scatter symbols and the number of reels activated. Please take note that a Golden Coin or Gold Fortune Dragon wild symbol that appears on a grayed out (deactivated) reel position can still be able to trigger the Triple Fortune Dragon Bonus Feature game. Triple Fortune Dragon Free Spin Bonus Feature Game – You can have the chance to win up to 360 Free Spins in the Triple Fortune Dragon Bonus Feature game, and you can also earn a Scatter award whenever you obtain 3, 4, or 5 Golden Coin scatter symbols anywhere on the first 3, 4, or 5 reels respectively. What online slot players love about this slot game is that the Gold Fortune Dragon wild symbol can substitute for a Golden Coin scatter symbol (not common in most slot games). A Golden Coin or Gold Fortune Dragon wild symbol that appears on a grayed out (deactivated) reel position can still be able to trigger the Triple Fortune Dragon Bonus Feature game. The amount of Free Spins awarded and the Scatter award multiplier is dependent upon the amount of Golden Coin scatter symbols and the number of activated reels. Your total Scatter pay award is the equivalent of the Scatter pay multiplier (listed in the paytable) times your total bet. Your designated bet for your Free Spins is the same as the total bet that triggered the Free Spin Bonus Feature game. Not only do the reels change in appearance in the Triple Fortune Dragon Free Spin Bonus Feature game, but they also become extremely rich with each Gold Fortune Dragon wild symbol in a winning combination (which triples your awards)! • One Gold Fortune Dragon wild symbol included in a winning combination will give you 3x your standard award. • Two Gold Fortune Dragon wild symbols included in a winning combination will give 9x your standard award. Only the biggest Gold Fortune Dragon wild multiplier is paid out for a winning combination. If within the Free Spin Bonus Feature game you obtain 3, 4, or 5 Golden Coin scatter symbols anywhere on the first 3, 4 or 5 reels (respectively), you will receive extra Free Spins of up to a max of 360 Free Spins for your whole bonus, and it will be topped off with a Scatter award pay too! Since the Gold Fortune Dragon wild symbol can substitute for a Golden Coin scatter symbol, you can receive a 3x larger scatter award if you obtain a winning combination of 3 or more Golden Coin symbols containing a Gold Fortune Dragon wild symbol. You can receive a 9x larger scatter award if you obtain a winning combination of 3 or more Golden Coin symbols containing 2 Gold Fortune Dragon wild symbols. Please take note that the Gold Fortune Dragon wild symbols will not affect the amount of extra Free Spins given to you. Your overall bonus prize wins is the sum of all awards you’ve won from your Free Spin rounds. When the Triple Fortune Dragon Free Spin Bonus Feature game is over, you are taken back to the regular Triple Fortune Dragon online slot game and your Free Spin bonus game wins are added to your total win. Triple Fortune Dragon has 5 reels where you can have the opportunity to enjoy the amazing MultiWay game with 243 ways to win big! Instead of betting on individual pay lines, MultiWay gives you 243 ways to win for 25 credits only. The minimum bet is 0.01 coins and the maximum bet is 5.00 coins per line. You may wager from 1 up to 5 bet multiplier with the 243 ways.